In today’s world, there is quite a disconnect between people and the food they eat. On the Delmarva Peninsula, though, there seems to be a surging interest in the “buy local” movement, and even more organic and free-range opportunities than one might think, as well as a re-birth of farmers’ markets and community-supported agriculture. But, for the majority, food is still seen as something you buy, take home and then eat. According to the Biodynamics Farming and Gardening Association, the term “biodynamics” was coined after “a group of practicing farmers, concerned with the decline of the soil, sought the advice of Dr. Rudolf Steiner, founder of anthroposophy, who had spent all his life researching and investigating the forces that regulate life and growth.” The idea was brought to the United States in the 1930s by Dr. Ehrenfried Pfeiffer, who had worked with Steiner. The association describes biodynamic farming and gardening and says the practice “looks upon the soil and the farm as living organisms. It regards maintenance and furtherance of soil life as a basic necessity if the soil is to be preserved for generations, and it regards the farm as being true to its essential nature if it can be conceived of as a kind of individual entity in itself — a self-contained individuality.” While biodynamic agriculture pre-dates the term “organic” in agriculture, it uses many of the same principles of organic agriculture, such as farming without synthetic chemicals, composting, etc., but goes further into the “interconnectedness” of the soil, with “cosmic rhythms” and lunar cycles with special plant preparations. Carson says she views biodynamics as pioneering work in a world that only looks at production. “It views agriculture as working in harmony with nature, healing and renewing it so that our future will be better, as opposed to agribusiness, which has a more extractive point of view. An acre of diversified agriculture is always far more productive than an acre of one crop – especially when you grow organically and take environmental factors as part of the picture,” she emphasized. The Carsons live on their homestead and grow everything from berries to corn to cantaloupe to peppers. The farm also has horses that they are starting to use for farm work, and they save their own seeds. They have seedlings and other plants available for purchase, as well as fresh produce, jellies, seeds and medicinal herbs. Everything is recycled or used in a sustainable way to live “lightly in the land.” The homestead is like going back in time to the farms of yesteryear, from the treehouse – which is located in a plum tree and is secured with no nails and sided with free slab wood from a sawmill near Greenwood – to the old horse stables that are built with recycled barn materials from an old barn on the property and the new stalls, which use tin from a recycled commercial chicken house. There is no use for a dishwasher here, no dryer. And they generate their heat by wood alone. After leaving college, Carson said she moved to New Mexico, joined a commune and met her husband before finally settling back in the area just about a mile from where she grew up. Growing up, she lived with her grandparents, who were farmers, on a farm she explained as being “much different than it is today.” “My grandparent’s farm was a very diversified farm – like many farms that have all but disappeared from our rural landscape, that have been replaced by factory farms. We had cows, goats, sheep, pigs, ducks, as well as a commercial hatching egg production houses. We did our own butchering, smoked meats, and canning and freezing, and raised most of our foods. We cannot continue the current type of industrial agriculture,” she said of most modern farms, adding that it doesn’t help the soil or create diversity. “The cost of the industrial model is reflected in the loss of our health and the planet’s health,” said Carson. “We need people employed and engaged in growing healthy foods again, even if just for themselves,” she said. 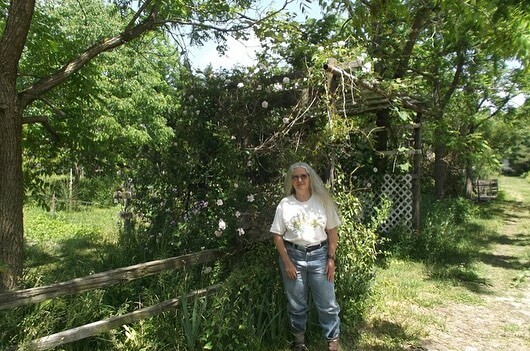 Sharon offers classes in gardening (including seed starting, saving, composting, water systems, tillage raised beds, succession and companion planting, and cover crops), as well as classes in preserving foods, home butchering, hatching poultry, propagating plants, willow basket weaving, home winemaking, and herbs, and she offers tours by appointment. Their website is www.sharonsnaturalgardens.com.